The village of Milton Kirdmore is fascinated by the new resident at the residence known as “Donyatts”. Maurice Robthorne, a retired gentleman, has rented the house for a year, but seems to have little interest in mixing with the rest of the village, which needless to say is enough for the village as a whole to be utterly fascinated with him. Especially when Warwick Robthorne, Maurice’s twin brother comes to stay. And then, on Guy Fawkes’ Night, a shot rings out from the greenhouse at Donyatts and Warwick is found dead on the ground, shot in the head. A clear case of suicide – the bullet went straight up through Warwick’s head and into the roof of the building. The inquest is concluded and everyone is satisfied – Warwick shot himself. There was no way anyone could have murdered him. End of story. An early Dr Priestley title – the seventeenth, but early relatively speaking, to feature the “militant scientific critic” – and it’s a good example of what John Rhode does well, and, I suppose, one of his shortcomings. Let’s start with the shortcoming – he’s not great at subplots. He’s got a story to tell about a crime, there’ll be a character or two who’s designed to be the red herring and then there’s the murderer. The murderer will have a remarkably complex plot, usually involving framing someone, but a lot of characters are introduced to add a bit of colour, but never really engage with the plot. Take the majority of the villagers in Milton Kirdmore – they are an entertaining bunch. Rhode has a nice trick by livening up the inquests by ignoring a lot of the detail and giving us an entertaining sort-of Greek chorus of gossipy-theories instead. But with the exception of one or two of them, they really have nothing to do with the plot. That isn’t a spoiler, by the way. But on the other hand, what Rhode delivers here is a very tight, clever plot with a small handful of characters that had me looking the wrong way. There’s an obvious route to go with the twin brothers idea, and while it would be a spoiler to spell it out – Priestley only brings it up way after the average reader thought of it – rest assured that the solution is much more elegant than that. 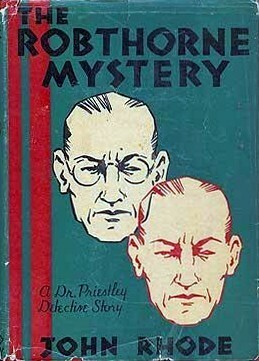 The Robthorne Mystery is sort-of available to the reader who doesn’t want to spend a small fortune on it – it’s in the Internet Archive. I think it was available as a dodgy ebook (i.e. the person in question made a new cover and use the Archive file) but it seems to have vanished from Amazon. Good. There seem to be less of these now, although searching for them doesn’t always pick them up, for some reason. But good on that too. Get it for free from the Archive if you must, don’t pay someone for it. Anyway – this is a charming mystery tale, with character, heart and a clever plot. One of the best Rhode titles that I’ve read so far. Highly Recommended. One of the best Rhodes? Now you have whetted my appetite! Good luck finding an affordable copy… unless you try the Internet Archive and read it for free of course. While part of me is proud of my Rhode collection and want to build it up as much as possible, I’m becoming more and more disappointed that the books as a whole are not available to the masses. As I said, this is available to download from the Internet Archive – it needs a bit of jiggery-pokery to convert it to being read on a Kindle. Now in the past, I’ve been dead set against the Archive, as it basically violates international copyright laws – while some of his books are in the public domain, apparently, somewhere, they are most definitely not elsewhere. So until the Street estate chooses to re-release these much overlooked classic crime books, I’d say go for it. Checking, this one, Death In The Hop Fields and Death Sits On The Board are all available and all well worth your time. I recommend this one in Masters and, yes, Street did have a dry wit, something his defamers like Julian Symons and Francis Nevis have missed entirely. I tried for years to get all the Streets reprinted in English by reputable publisher, but the estate never seemed inclined to work with anyone, sadly. Street was made for the electronic age, with all the books he wrote. It’s been my biggest disappointment in mystery reprinting. I completely agree. While not everything is a classic by any means, there are so many excellent titles in his catalogue, and many that I’ll never be able to get my hands on with my budget – most of the early Burton titles, for example. Once my set of Rhode reviews is more complete, I intend to try and contact the estate myself (and point them in your direction). Maybe if I can demonstrate the affection for his work and the desire by my readers to try it, it might sway them… you never know. Oh, and I’ve read the Street section of Masters – I bought it on Kindle a while ago. Excellent work. This was the first Rode I read, and it definitely made me want to read more of him. I agree about the plotting, but it was an inventive read on my Kindle, where I have since found many books made available by the author. Well, the Kindle titles are all a bit dodgy – either free ones that are still in copyright in certain regions via the Internet Archive, or paid for titles that seem to have been lifted from the Archive without the permission of the estate, as far as I can see. But until the estate gives permission for the titles to be officially re-released, I’m beginning to understand the appeal of the Archive.